Linda Rice’s talented gelding Championofthenile is clearly the horse to beat, but it’s fair to wonder whether we’re going to see his best performance in his first start back off a lengthy layoff. Furthermore, he’s going to have to deal with pace pressure from True Bet as well as potential speeds Giantinthemoonlite and Big Zip. While I’ll use this favorite defensively, I see two viable alternatives at decent prices. My top pick is CELTIC CHAOS (#2), who should finally get some pace to run into in this spot. He’s now contested two straight races that have just not set up for a late runner such as he. This was especially true last time when the frontrunners crawled through the opening furlongs (note the pace coded blue in TimeformUS PPs), and he actually did well to get as close as he did at the finish. Two back, Eric Cancel let him drop too far off a moderate pace in a small field, and he was just given too much ground to make up in the stretch. That said, he still put in his usual furious rally and deserves credit for even getting within two lengths of the winner at the wire. This horse has been in deceptively good form, and I think he’s sitting on a breakout performance. At an even bigger price, I also want to put a few dollars on longshot GIANTINTHEMOONLITE (#6). 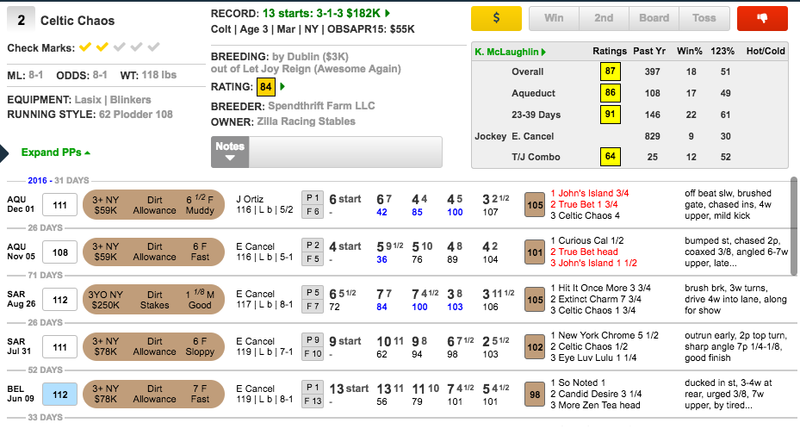 I know that his recent form is not terribly inspiring, but he’s getting a major trainer switch to Charlton Baker, who excels with runners coming off layoffs (94 TimeformUS Trainer Rating). 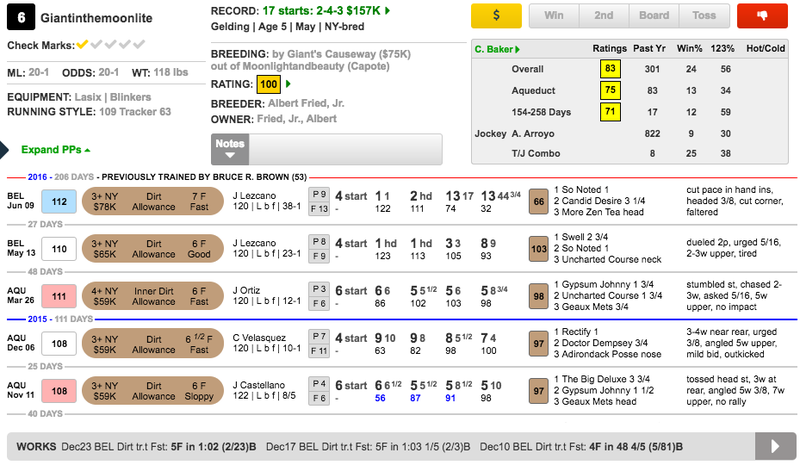 Baker is also known for his success with runners making their first starts out of his barn (88 Trainer Rating). This gelding has run some decent races in his career and has proven himself capable of putting in a strong performance of a layoff. I’ll play each of these horses to win, and will key them in exactas with the favorite, Championofthenile (#1), as well as the reliable contender Nobody Move (#9), who would also benefit from a battle up front. 10 and 11 look like value here.